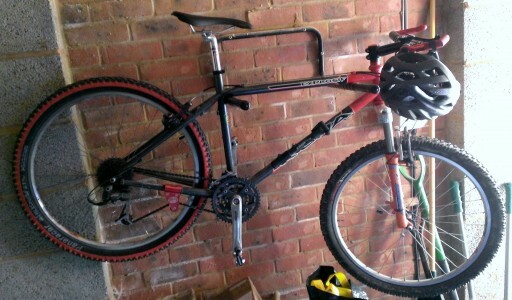 I currently have a Kona Explosif 1999 model, which I hand built myself, and I’m very fond of. It has a steel frame – Reynolds 853 tubing – and has a ride that only steel gives. It accelerates like whippet, especially offroad and on technical sections and gives me a grin even when I just take it round the block. However, I built it in 1999, and it needs some serious maintenance and upgrades now. The entire drivetrain is shot and needs replacing, the forks are worrying me a bit (but are probably ok) and at the weekend I bent one of the brake levers (it’s got V brakes and it pre-dates discs!). The thing is, by the time I’ve replaced the drivetrain and maybe forks and front brake, I could have bought another bike. A quite reasonably priced bike. I built the bike with reasonable kit of the day – Deore LX, which was a brand new groupset at the time. It has since been superseded by Shimano’s SLX, which would be a direct equivalent. The fork is Marzocchi Z1 BAM – again great for its day, but heavy and technology has moved on enormously. To upgrade I will need a full drivetrain, around £250, another £170 for the front brake (as I would need a new front wheel too) and then maybe a new fork – another £250 – to get comparable products. For that £700 ish, coupled with the Cycle To Work scheme, I would have £1,000 to spend on a new bike, which would definitely buy something good. So I’m going to be looking at a few new bikes and compare them to the upgrade equivalent, and see what comes out best – I’m fairly open at the moment, so let’s see what’s out there.